We scrimp and save and work. We look high to climb some professional ladder. Maybe we stall a few rungs from the top. We still dream. We always dream. The Memphis Redbirds poured more than $2 million into a new video board with the hope to engage fans in new ways every game. Until then, they can at least say they have the biggest board in the minors. Every year, minor leaguers throw a couple no-hitters — five or seven innings solo, nine innings combined, rarely nine innings solo — and all of them ultimately footnotes. There is no single list of minor league no-nos. They just fade away. Visalia’s groundskeeper was crushed by a car and their broadcaster wrote a book. Here are their tales from the field and the booth. The Lake Elsinore Storm received national attention for their Tim Tebow trade proposal and Charlie Sheen-co de Mayo promotion. How does the team keep making headlines? Kaleb Cowart pitched from kindergarten until his high school graduation. He wanted to hit, though, and feel the thrill of rounding the bases after hitting a homer. The Los Angeles Angels wanted that, too. Before he played in the majors, Jonny Gomes hit 63 homers in the minors, suffered a heart attack and, on a lighter note, became a certified personal trainer. 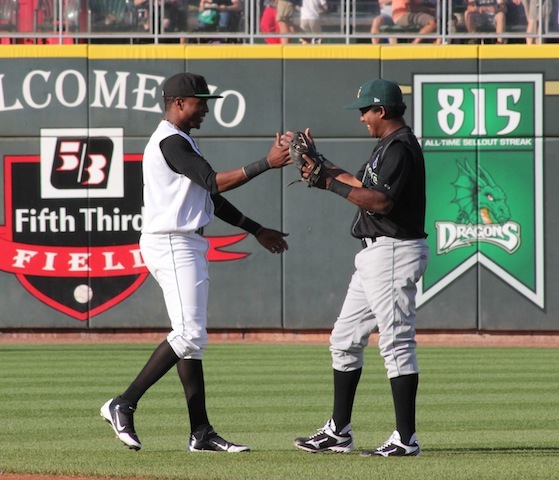 The Dragons faltered on their way to a 9-1 loss to the Kane County Cougars, but fans were still entertained between innings ... by the ZOOperstars. Our 2013 schedule still is in development. 26,000 miles. 120 teams. 1 season.